A perennial garden that attracts wildlife--and specifically birds and butterflies--is a fun project to create and enjoy. Creating a perennial garden that draws birds and butterflies serves the purpose of conservation of these wild creatures while offering the homeowner a beautiful haven to enjoy and observe. A bird and butterfly perennial garden provides food and shelter for wildlife and offers a close-up view of the creatures that visit. Gardening to attract butterflies needs to provide the same elements that are used to attract birds--food and water, shelter and a place for butterflies to raise their young. Food for butterflies can be provided in the form of nectar plants. Nectar plants that attract and feed butterflies can be a combination of annuals, perennials, herbs, shrubs and native wildflowers. A water source for butterflies can be in the form of a puddle. A simple puddle can be created by filling a bird bath or a dish placed on the ground with sand and rocks. Fill with enough water to soak into and cover the sand. Shelter for visiting butterflies can be provided in the form of shrubs and/or trees in which the butterflies can rest and hide from any nearby predators. Host plants that butterflies can lay eggs on should be a part of any butterfly garden. Food, water, shelter and a place to raise young can be provided easily enough as part of a perennial garden in order to attract wild birds. Adding these elements to a garden creates a haven for wild birds. Feeding stations with bird feeders offer food for winged visitors while a bird bath provides water. Choosing a garden location close to trees provides shelter, but if the garden cannot be situated near trees, there are other shelter options. Bird houses designed for specific species of wild birds are great choices for providing shelter and can be incorporated into your garden landscape with trees or without. The choices of perennials for a garden will matter more to the butterflies than the birds. Visiting butterflies will search for nectar and host plants specific to their species. Most birds will be more interested in the offered bird feeders in the garden. Hummingbirds, specifically, will be attracted to plants with flowers that are tubular-shaped. Perennials that will attract both birds (especially hummingbirds) and butterflies are jewel weed, red hot poker, columbine, butterfly weed, cypress vine, morning glory, trumpet vine, penstemon, bee balm, foxglove and hollyhock. Some perennial wildflowers will serve several purposes for both butterflies and birds. Thistle attracts butterflies for feeding and provides a host plant for some butterfly species. 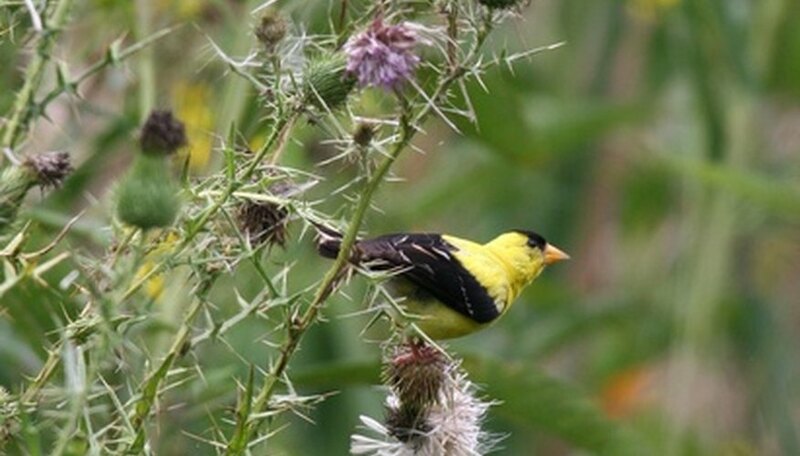 Thistle is also a nesting plant for small birds like goldfinches and the seeds can provide food for birds. Perennials that can serve as both host plants and nectar plants for butterflies are excellent choices for inclusion in a perennial garden for birds and butterflies. An example would be milkweed, which provides nectar for several species of butterfly while also serving as host plant for the monarch butterfly. Determining the species of butterflies found in your specific area will aid in choosing perennials to attract butterflies. In addition, knowing the types of wild birds that are found in your location can help you make better choices in plants, bird feed and shelters. Gardens With Wings: What is a butterfly garden?